Recently updated home. Enjoy unobstructed views from your deck as this home is located on the Beach front of the Atlantic Ocean. Excellent location for this very popular family vacation location with great views. Covered and open sundecks facing the beach. 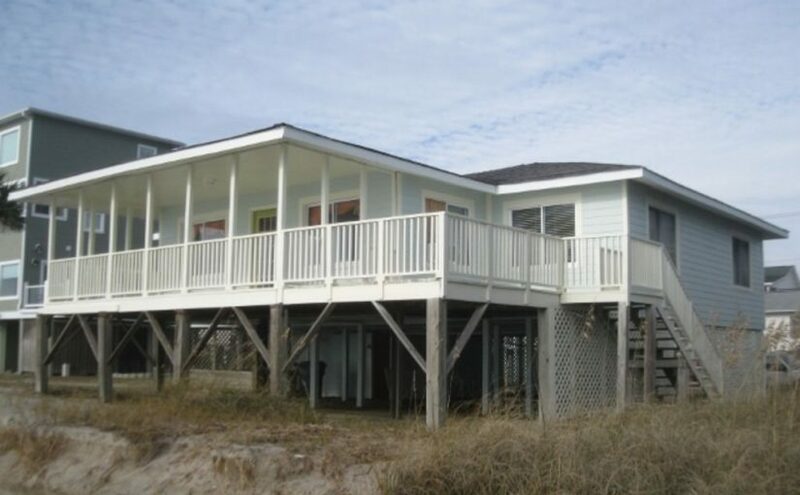 This home has your traditional Edisto Beach floor plan with the living, dining, kitchen combination in the center of the house and the bedrooms and baths on each side. 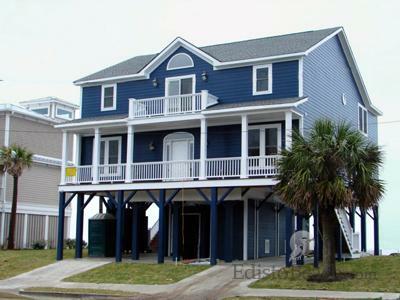 Both beach side front bedrooms have a queen bed and they open to the beach front deck. Back bedroom has twin beds and one bedroom has a queen bed. Stereo system, there is a full bath on each side of the house with a tub/shower combination. Great place for the entire family all year long. A private boat slip is available, and is conveniently located with access to deep water for great fishing or just cruising. Check for availability. One week minimum stay required for months of June, July & August. Please call for additional information. Linens and towels included. Pets allowed with a pet fee. A colorful, well-maintained, classic southern beachfront house. Complete with pine floors and walls. New flat screen TVs, All New microfiber furniture, kitchen table seats 10. This home has the traditional kitchen,dining and living combination in the center of the home with 2 bedrooms and a bath on each side. The right front(beach view) bedroom has a king size bed, the left front a queen. The left back bedroom has a double bed and there are a twin over full bunk bed and an extra twin in the back right. Both full hall bathrooms have a tub/shower combination. The living area opens out onto a large porch with a sundeck on the left side of the porch. The beach is just steps away! Weeks only June-July-August. Shorter stays available Sept-May. Linens and Towels Included for an extra cleaning fee, Pets welcome with Current Vaccinations and a small fee. Additional boat slip available with additional fee at Edisto Marina. Outstanding view from this fully furnished 5bed,3bath oceanfront home! Home offers stunning ocean views, sea breezes and access to both covered and open sundecks off the main level and off the upstairs. The walk-through kitchen has great access for entertaining on the connecting covered and open sundecks. 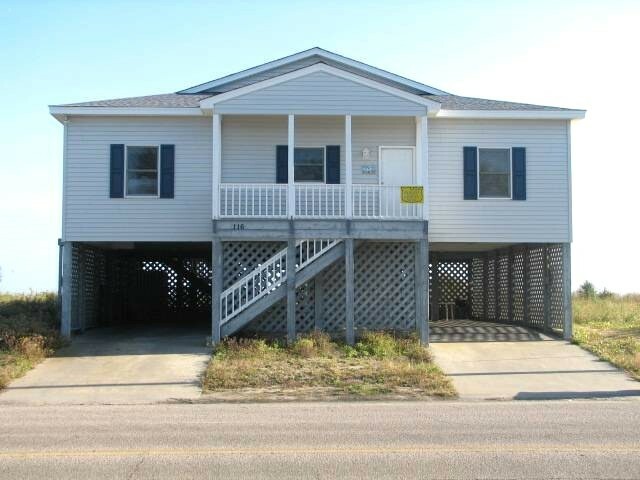 This is a great beach front home with an easy floor plan for a few or many guests! Two bedrooms are on the first floor and three of the bedrooms are upstairs. Four of the five rooms are on beach side of the house with doors opening to the ocean side decks. The bathroom on the first floor has a shower and two of the rooms upstairs share a shower with a shower and tub. The spacious master bedroom is upstairs with full bath and double sink. Galley kitchen looks into den and dining area and has a glass door giving you a great view of the ocean. Cable TV and Internet service available with new Flatscreen tv’s. Built in Stereo system located above the frig with speakers in every bedrooms and entire house both floors great for entertaining. Hardwood floors downstairs and carpet upstairs. Two large outside decks extend the full length of home. Lower level of the home has plenty of covered parking, an outside enclosed hot and cold shower, a spacious 350 sq foot storage room for beach toys. The house is directly on the beach making trips from the beach to the house only a matter of seconds. Edisto Beach is a peaceful secluded island to relax and enjoys Natures beauties from the comfort of your own home. A private boat slip is available at the Edisto Marina for an additional cost, and is conveniently located with access to deep water for great fishing or just cruising. Check for availability. Stunning oceanfront beach house. 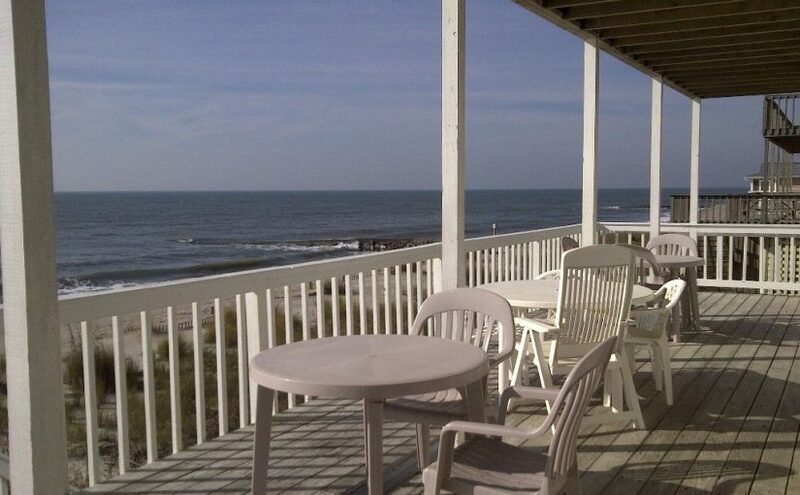 Watch dolphins swim from the full covered porch with the Atlantic as your front yard. Spacious, well-appointed home with vaulted ceilings and hardword floors. 2015 updated with new paint throughout kitchen, living room and cabinets, new fans, All new furniture in living room (pictures to come Soon). Open kitchen, dining, and living room, all with full view of the ocean. Master bedroom with private bath and ocean view. Family friendly with plenty of room for the kids. Total of four bedrooms (accommodating twelve guests), one full bathroom, one private master bath with shower and double sinks, and two ocean front bedrooms (including master). Back bedrooms contain two twin beds (can be used as king bed) in one room, and two queen beds with overhead bunks in the other room. Convenient main floor laundry located just off the kitchen. Newly installed R/O drinking water system. Two large covered parking spaces. Outdoor hot/cold beach shower and picnic table in lower patio area. Have a large crowd? No problem! We have a similarly appointed house next door! Check for availability #442093 Both houses are conveniently located within walking distance to local shops and restaurants, and less than one block from the grocery store. Cable and Wi-Fi service. A private boat slip is available, and is conveniently located with access to deep water for great fishing or just cruising. Check for availability. This large beach front home has plenty of room for an extended family to come and enjoy the beach. Amazing ocean views from the first and second floors. This home enters into a large foyer with the staircase to the 2nd floor. A 1/2 bath and the laundry room are accessed from the front hall. The entryway opens into the large living, dining and kitchen areas of the home. A nice sunroom is connected to the dining area. There is a screen porch adjacent to the living room with seating and amazing views of the beach and water. To the left of the living room is the master suite complete with king size bed, TV, and large private bath with a tub/shower and separate water closet. The 2nd floor has a hallway that leads to 4 more bedrooms and a loft. The large bedroom to the left at the top of the stairs has 2 queen size beds, a dressing area, and large bath with a tub/shower and separate water closet. Another bedroom in the center of this floor has 2 queen beds as well. The large bedroom next to this has a queen size bed. All 3 of these bedrooms open onto a deck overlooking the ocean with an amazing view. At the end of this hallway is a full bath and shower room that connect to each other. This first part of the bathroom has a large vanity and sit down shower. This joins a full bath with a tub/shower, and toilet. Across the hall from the 3 beach front bedrooms is a bunk room with 2 sets of bunk beds. This connects to a loft area overlooking the staircase with a trundle bed. This area may be shut off from the bunk room. All of the bedrooms on this floor have a TV. This home has tile throughout for easy maintenance. 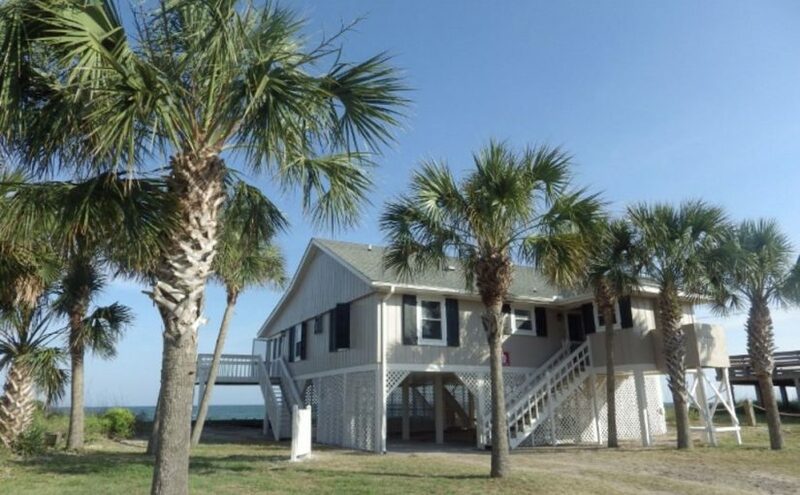 “Tropical Breeze” is a great choice for a fantastic Edisto Beach vacation. You cannot get much closer to the water than this! Call Edisto Realty today at 1-800-868-5398 to book this beach front property. Additional amenities include a gas and charcoal grill, elevator to 1st floor, enclosed outside shower and fish sink. Pets allowed at this property for an additional non-refundable plus tax pet fee. (See Pet Instructions). Security Deposit or non-refundable Damage Waiver, No Smoking.No Linens. Optional Departure Cleaning and Travel Insurance are available.